Plastic stands are not as preferable but are more than suitable for artificial trees. Steel Christmas tree stands are better for real, massive trees. To choose the best Christmas tree stand this Christmas, you need to focus on its strength, price, and capacity. You also need to think about the height of the tree, the diameter of the trunk, and how you want to secure it in place. Choosing a Christmas tree stand is a challenge because not all are going to suit your needs well. However, if you check out these options below, you are sure to find a stand that will tick all the boxes for this Christmas and many more to come. If nothing quite beats having a real Christmas tree in your living room, then you are going to need a quality Christmas tree stand to go with it. As soon as you see this one from Krinner, you will know it’s going to tick all the boxes. Known as a Tree Genie, it’s a marvelous piece of technology that enables you to keep trees up to 12-foot tall in your living room. 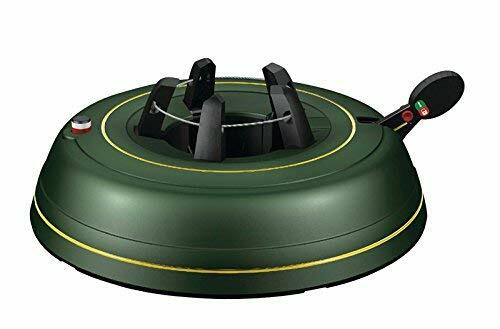 It’s capable of catering to trees with bases of seven inches in diameter or less and has an 18-pound frame to offer plenty of weight to secure it. If that’s not enough to convince you of its efficacy, then the six different size options might. No matter the tree size you usually get, this Christmas tree stand is sure to be of assistance in keeping it securely in your home. So your tree lives to tell the tale, it can get plenty of water too. It holds 2.5 gallons of water in its base with an automatic water level to let you know when you need to add more. Adding more can make a mess, but it’s a small price to pay for the convenience of the stand itself. It’s also effortless to install, takes less than a minute to set up, and is a quality unit made in Germany. Let this Christmas tree stand impress you this Christmas. If you only intend on using a Christmas tree stand for a couple of years, then you may like to purchase this one from Emerald Innovations. While it lasts, it’s a fantastic stand, but it’s the longevity that’s the problem. You can use it wonderfully for a couple of years, but you may not get any more out of it than that. While it’s working, however, it will impress you. You can use it with threes up to 12 feet high and benefit from an impact-grade polymer that doesn’t rust, crack, or harm anything around it. It even has separate trunk receptacles and a 1.5-gallon water capacity to seal the deal. If you’re worried about the mess a Christmas tree stand makes, this one covers all bases. It has drain slots to minimize any untidiness it makes while blending in with the tree. 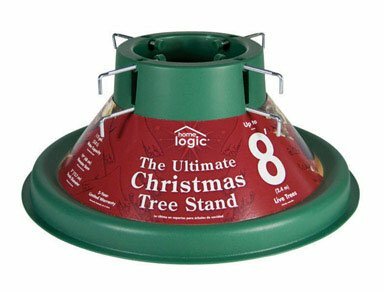 This Christmas tree stand is a little pricey, and it doesn’t hold trunks of broader diameters – catering to trees only up to 5.75 inches. But, it’s ideal for people who need a quick solution for housing their Christmas tree. Even though this Christmas tree stand is not ideal for trees larger than 11 feet tall, it’s still going to be appropriate for the masses. Everyone with a regular-sized Christmas tree will enjoy what stability and style this unit will bring into their home. You can use it for trees with a six to 11-foot height and benefit from the reservoir for 1.65 gallons of water. This tank will ensure the tree stays fresher for longer. What’s more, it has a 360-degree ring base and four T-bolts. This unique setup means that the tree trunk gets security and balance all around it – making sure it stays in place and doesn’t tip over. However, that’s not all this simple yet effective Christmas tree stand has going for it. You can buy it in red and green, green, or white with beautiful gold trim. No matter your preference, Yard Butler will deliver. It also features powder coated steel which is rust-resistant and long-lasting. There is no reason why this Christmas tree stand will not last for as long as you need it. It’s robust and reliable, has a straightforward design so won’t be difficult to use, and comes with an affordable price tag. If you need a new Christmas tree stand, this one may be an excellent option. If the time has come to make arrangements for your Christmas tree, then don’t forget to buy this Christmas tree stand from JACK-POST. As a more affordable option to many other tree stands on the market, it could be the very thing you need to get your tree up quickly and safely. You can buy one of three sizes – medium, large, and extra-large – all of which will suit your needs well. You can cater for trees up to 12 feet tall with trunks up to seven inches in diameter, all the while keeping it firmly in place with a screw system. The screw system consists of four T-nut tipped eye bolts featuring corrosion-resistant zinc-dichromate hardware. Secure these into the tree and keep it firmly in place to stop the tree from toppling over. What people don’t like about this system, however, is that the screws become filled with gunk and almost unusable for the next year. However, with its competitive price tag, robust tubular steel legs, and compact size, it’s an excellent option for many families looking for a no-frills Christmas tree stand. 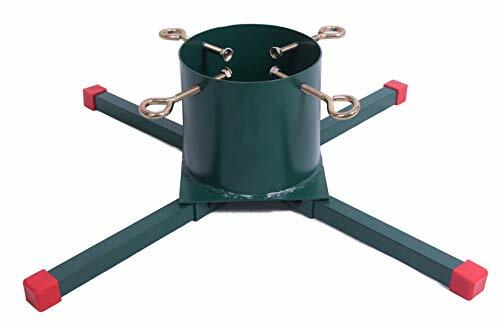 If you are one of many people who go through several tree stands because none seem to hit the mark, then set your sights on this Christmas tree stand from Goliath. Even though you do pay more for the privilege, it’s going to save you a lot of money down the road. 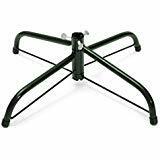 You will never have to purchase another tree stand again. It features welded steel, holds trees up to 16 feet high, and has a nine-inch trunk capacity. As a result, you can rest assured that big tree you buy is going to sit sturdily and safely in your home. Then, it even offers a generous 1.8-gallon tank to make sure it gets as much water as possible. This Christmas tree stand is leagues ahead of its competition, but another reason for it is its screw system. It has four steel support screws on the welded steel and powder-coated frame that offer all-around support. Its 42-inch leg span also keeps the base balanced on the ground. You will never have to worry about your Christmas tree toppling over again. Even though this Christmas tree stand comes with a lifetime warranty to give you peace of mind it will last the distance, it may not end up being your first choice for many reasons. There is no denying it’s a solid stand with steel construction and a powder-coated finish, but it does have a few flaws amongst its standout features. It can hold a tree up to 10 feet high with a 6.5-inch trunk, but it may struggle to distribute the weight evenly to the base. The base, even though it’s for weight-absorption, doesn’t seem to be broad enough. As a result, there is a lot of pressure on the vertical retaining arms to perform. So, you can end up with a tree that’s not stable. What’s more, the impact-grade liner can leak which can cause a mess. Even with the addition of the generous water tank, rust-proof lining, and anti-scratch floor pads, this Christmas tree stand may not be the best one for your money. If your artificial Christmas tree does not come with a stand, then you may be in the market for a new Christmas tree stand. Fortunately, EZ covers all bases for artificial tree stands. Instead of hoping your tree doesn’t fall over, you can keep it firmly in place with this green plastic masterpiece. It’s affordable and won’t break the bank, all the while catering for trees up to seven and a half feet tall. 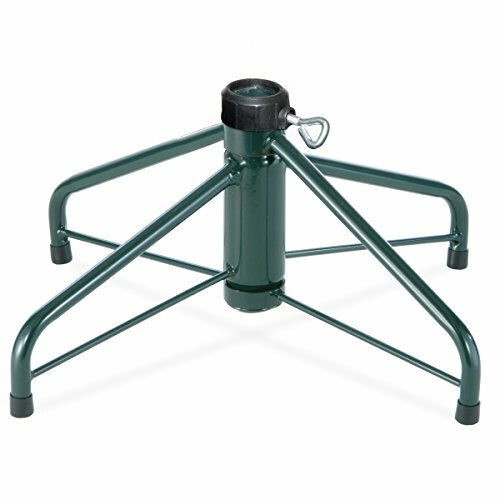 It also has a 19.25-inch diameter base to keep it as secure as possible, with 1.25-inch poles. However, for all its good points, there are a few things you may not enjoy about this Christmas tree stand. 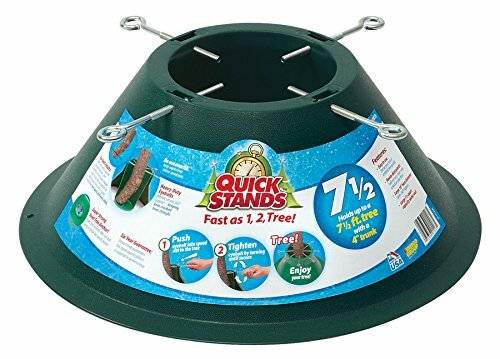 It looks cheap, is too short for larger trees so can be unstable, and the plastic itself, even with 1.95 pounds of weight holding it down, can deteriorate over time. 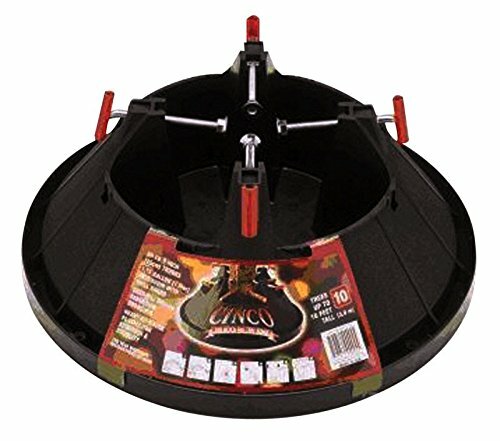 There is no denying this is a convenient Christmas tree stand for your tree, but it’s not the best on the market. Buying a Christmas tree stand for an artificial tree can be a bit of a gamble – as you never know what you are going to get. In the case of this one from the National Tree Company, however, you can expect a relatively good Christmas tree stand for the money. There is no denying it has its flaws, but it’s robust and hardy unlike many other options on the market. It can cater to your tree as long as it’s between six and eight feet tall, and it folds flat when you are not using it. As a result, once you pack your tree away for another year, you can collapse the legs down and store the stand flat as well. Plastic models do not offer this same convenience. It also comes in a green color scheme to blend in with your tree, has a 24-inch base, and features robust steel with thumb screws so it will stay in place. It also doesn’t take a lot of effort to set up. However, not every unit you get in the post will have all the screw holes drilled out properly, and it can lean over. These two faults lend toward poor checks before leaving the factory. If you get a good one, however, it will suit you well for the remainder of your Christmas tree putting-up days. If you are not convinced that a foldaway metal Christmas tree stand is the way in which to secure your tree safely, then set your sights on this model from Good Tiding. 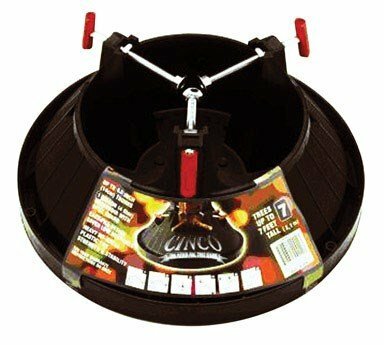 As a Cinco Express tree stand, it’s green in color and is suitable for all real Christmas trees up to 10 feet high. It will also hold all trunks firmly in place as long as they are seven inches in diameter or less. It’s green in color, comes with galvanized pins to keep the trunk securely in place, and even offers a deep spill guard. This guard works by making sure if any of the two-gallon water tank spills out, it will not make a mess of your floor. However, that’s not all this Christmas tree stand has to offer. Even though its bulky and hard to store, it will give you peace of mind when you use it. It keeps your tree firmly in place, doesn’t cost the earth, and is lightweight at the same time. It’s also effortless to put up and has reinforced screw holes to make sure it ticks all the boxes for your needs. It may not be the prettiest Christmas tree stand on the market, but it’s one of the sturdiest. Christmas is only ever 12 months away at the longest point, which means any time of the year is an excellent time to purchase a new Christmas tree stand for your family. However, too often people end up disappointed with what arrives. Why? They do not do their due diligence. You need to work out what you want, what you need, and what you are willing to pay. Here are some of the many considerations for choosing the best Christmas tree stand for the money. When you are on the hunt for a new Christmas tree stand, think about the real tree you usually buy, or the artificial one you currently own. Remember, all tree stands are different, so you need to match the capacity to your tree. Measurements to think about are the trunk’s diameter and the tree’s height. Each tree stand has a capacity for each to make sure it stays firmly in place. 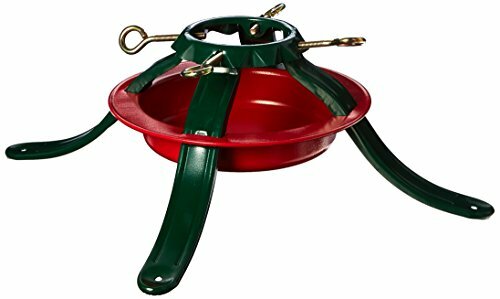 The holding system for each Christmas tree stand can also differ. Some use screws to dig into the tree, while others rely on clamp-like systems to hold it tightly in place. The hardest part is getting the tree to stay upright and not want to bend over. Not every Christmas tree stand can achieve this, so read the reviews. Find out from real customers how they found the tree’s support system to be. Unfortunately, most Christmas tree stands on the market are not cheap to buy. Given the number of different materials and components and the strength they require, it can be a significant investment for any family. Artificial tree stands tend to be more affordable than those for real ones, but are not as strong. Always compare the features on offer regarding the price to make sure you are making the correct purchasing decision. The materials can make a massive difference to how much you are going to like your new Christmas tree stand. Many of them feature plastic which is not very strong, while others are steel. The best Christmas tree stand is one with galvanized steel coupled with powder coating. Such a combination makes sure it handles the elements while lasting the distance. Plastic bases tend to be more suitable for lightweight artificial trees and are more challenging to store away once Christmas is over because they don’t fold up.